Golf equipment and fashion retailer Green18 has almost doubled the sales area of its new store in Sandyford, Dublin, with the installation of a 351 square metre Mezzanine Floor and Feature Staircase, designed and built by Euromech. Golf is no longer seen as elitist, old fashioned and conservative. The sport is thriving and is played by a younger, more in tune, more style conscious group of men and women. 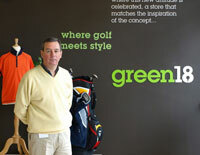 One of Ireland’s newest golf stores, Green18, is tailored for these players. 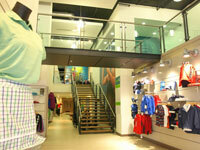 Green18 recently opened its first 10,500 square foot store at the Beacon South Quarter retail centre in Dublin. The high-end store provides a wide range of goods and services including a golf and leisure wear boutique downstairs catering for women and children in additional to a golf equipment and clothing store for men at mezzanine level. Custom fitting, adjustment and repair of golf clubs. Its own 10 metre long putting and chipping green. 2 golf simulators overseen by PGA Professional, Padraig O’Rourke. Euromech’s brief was to maximise space without compromising the open feel of the display area, which had to accommodate a wide range of new products from worldwide sources as well as equipment trial and practice facilities for customers. Euromech designed a 351 square metre mezzanine which was unique in its design by including a “bridge” over the main stairway, that leads to the putting green area. 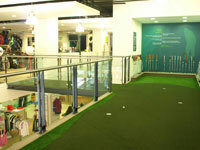 The client specifically requested this concept in order to maximise the amount of natural light at the front of the store, as well as adding to the uniqueness of the putting green. 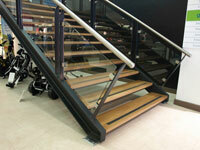 Attractive glass-infill balustrades were installed along the bridge as well as on the open sections of the mezzanine. This design was continued down the main stairway, which contains hardwood treads that feature a special hardwearing, slip resistant insert.